Higher education gets the Marx Brothers treatment in 1932’s Horse Feathers. Set at Huxley College, Professor Quincy Adams Wagstaff (Groucho Marx) takes over as the school’s president. His son Frank (Zeppo Marx) attends Huxley, and apparently he’s been there for 12 years. Frank fools around with “college widow” Connie Bailey (Thelma Todd), an affair that bugs Quincy and causes Frank to neglect his studies. Frank tells his dad that Huxley’s had a new president every year since 1888, and they also haven’t won a football game since then. Frank wants Quincy to improve the team to bolster the college. Frank instructs Quincy to recruit two players from a speakeasy. Unfortunately, gangster Jennings (David Landau) beats him to the punch and obtains the players for rival Darwin College. Soon we meet Baravelli the iceman (Chico Marx) and Pinky the dogcatcher (Harpo Marx) at the speakeasy. Wagstaff mistakes Baravelli and Pinky for the football players and recruits them. More complications occur when we learn that Frank’s lover Connie works for Jennings and dallies with Frank just to snoop on the Huxley squad. The rest of the movie follows the issues connected to the teams and climaxes with the big game. That synopsis makes Feathers sound a lot more plot-focused than it actually is. Like virtually all Marx movies, the story acts as little more than a springboard for comic routines. Feathers indulges in its plot only sporadically, as it uses the football backdrop only when it feels like it. The climactic scene depends on the gridiron setting, but otherwise those elements could get the boot and no one would ever notice. Feathers continues the trend seen in Monkey Business in that it focuses more on the Brothers than anything else. That’s a good thing, for their first two movies included far too much material that dealt with extraneous and dull characters. Feathers lacks the tightness of Monkey, and it reverts to the use of the Brothers in character. During Monkey, they essentially played themselves, albeit in their caricatured way. While Feathers doesn’t work as well as its immediate predecessor, it still remains pretty satisfying. The movie features some of the Brothers’ best-known bits, such as the famous “swordfish” routine. Happily, it also avoids most of the musical numbers that marred the earliest flicks. We do get a couple tunes, but they pass quickly and don’t cause the movie to sag too badly. Unfortunately, Feathers doesn’t lack the usual piano piece from Chico and the pretentious harp solo from Harpo. Apparently every Marx movie included those segments, and they never worked. Actually, Chico’s performances occasionally fit into the movies, as they sometimes connected to the action acceptably well. That was never true for Harpo’s strumming, though, as those elements consistently ground the movies to a halt and offered nothing of value. That holds true for Feathers. In general, the positives I saw with Monkey Business continue in Feathers, and I like the emphasis on a fairly small cast. Actually, Feathers reduces the roster even more than in its predecessor. Really, it offers only two significant roles beyond the Marx boys, and both fit into the action just fine. 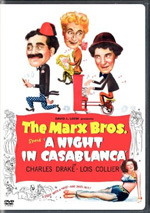 One of the better Marx Brothers flicks, Horse Feathers stumbles at times due to the same kinds of missteps that affect virtually all of their efforts. However, it emphasizes more positives than negatives. It usually offers clever and inventive comedy and presents an enjoyable experience. Horse Feathers appears in an aspect ratio of 1.37:1 on this Blu-ray Disc. Though inconsistent, the image mostly satisfied. Sharpness usually worked well. A few instances of minor softness emerged, but most of the movie demonstrated pretty nice clarity and accuracy. No issues with jagged edges or shimmering arose, but I noticed some light edge haloes. Blacks seemed deep and dense, and the movie exhibited nice silvery contrast, with smooth low-light shots. Print flaws remained few and far between – except during “archival” football footage. Those scenes came with so many specks that it looked like it was snowing. That appeared to be a natural outgrowth of the original footage, but one other concern made less sense. On a couple of occasions – most clearly at 21 minutes and 45 seconds – the picture displayed significant judder and related anomalies. These issues went away after a short period, but they created real problems while they lasted. Even with those issues, though, I still felt pretty happy with this transfer. The DTS-HD MA monaural soundtrack of Horse Feathers also worked relatively well given the movie’s age. Speech lacked particularly natural qualities, but the lines came across as intelligible and without prominent edginess. Music could be a bit brittle, but the score and songs offered acceptable clarity, and effects felt the same. Though those elements showed some roughness at times and never offered much heft, they fit within era-related standards. All this left us with a period-acceptable soundtrack. How did the Blu-ray compare to the original DVD from 2004? Audio seemed smoother and less distorted, while visuals were notably tighter and cleaner, with superior blacks and contrast as well. Across the board, the Blu-ray offered a massive improvement over the poor-quality DVD. Because the Blu-ray can be purchased only as part of a three-disc package with one disc partly devoted to bonus materials, I didn’t give Horse Feathers or the other individual discs a grade for extras. I’ll rate the set’s supplements as a whole when I look at that platter. The Horse Feathers disc does come with one extra: an audio commentary from film critic FX Feeney. He delivers a running, screen-specific look at story/character areas, cast and crew, ways the movie reflected then-current society, aspects of the production, some biographical notes about the Brothers and a few others, and his take on the film itself. Feeney delivers a competent but uninspiring commentary. I don't fault him because he repeats some info from the prior three tracks - that's inevitable - but he just doesn't seem to have a ton to say much of the time. We get some decent basics here with the occasional valuable nugget but overall, this becomes a mediocre discussion. 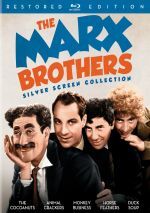 While not the Marx Brothers’ best work, Horse Feathers nonetheless sits close to the top of that list. It suffers from erratic focus and some pointless elements, but it usually scores with inspired comedic bits and lunacy. The Blu-ray brings us erratic but largely good picture and audio along with a lackluster commentary. This is an acceptable release for an enjoyable movie. 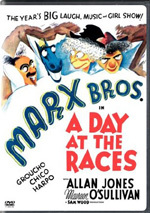 Note that Universal currently offers Horse Feathers only as part of The Marx Brothers Silver Screen Collection. This three-disc set also includes Animal Crackers, The Cocoanuts, Monkey Business and Duck Soup. The package provides one disc largely devoted to supplements as well.